Women going through menopause may feel anxious about losing muscle mass, the hourglass figure they had in their 20s and 30s. Skin around the breasts becomes more elastic, causing them to shrink or sag, while weight stubbornly clings to the midsection. Estrogen known as the female hormone, plays a starring role in the development of feminine traits, including breast size. With estrogen replacement therapies so readily available on the market, many women wonder if using these treatments will help fill out their bust line. Continue reading to find out. During menopause, your body naturally begins to slow production of estrogen. This decline may cause your breasts to look smaller because your skin is dehydrated and thus less elastic. However, weight gain is also a symptom of menopause, so it's not uncommon for women to report enlargement of breast size during this life transition despite decreased estrogen levels. Will HRT Give My Breasts a Boost? Estrogen replacement therapy is the most common hormone treatment. It can be taken alone in the form of pills, patches, rings, creams, or more commonly, as a combined treatment that contains both estrogen and progesterone. These treatments help to balance hormone levels by encouraging the production of estrogen, progesterone, and androgens in the body. Many women have reported increased breast growth as the result of estrogen-only or combined HRT. Keep reading for some warnings signs about estrogen replacement therapy. While HRT that contains estrogen have been known to increase women's cup sizes, they have also been linked with breast-related diseases. Many women have reported breast tenderness and sensitivity as the result of high dosages of estrogen replacement therapy. The National Cancer Institute reports that the Women Health Initiative (WHI) concluded that women taking estrogen plus progestin (i, e; synthetic progesterone) have an increased risk of breast cancer, although risk is lower in women with a higher body mass index. Women with a history of cancer are urged not to use HRT, as the treatment may encourage tumor growth and cancer recurrence. While bigger breasts may be an effect of HRT that contain estrogen, HRT should never be used for the sole purpose of enlarging breast size. Serious health risks are linked with high dosages and extended usage of HRT. 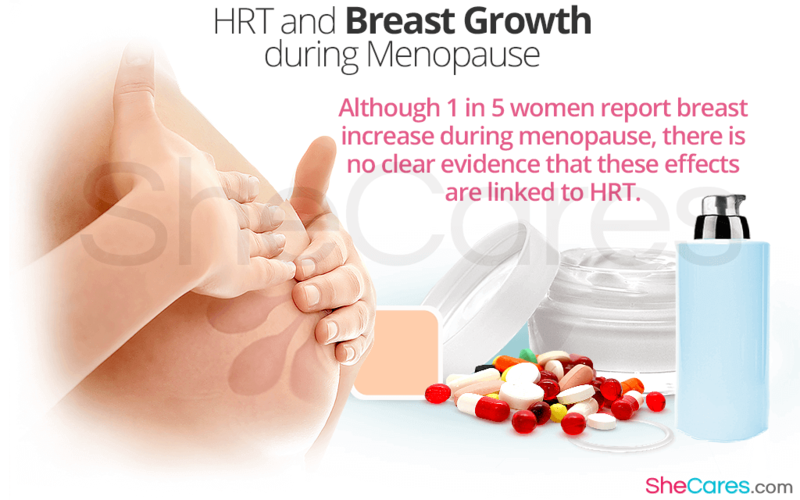 Click here to read more information about the side effects of HRT.